Congress is once again struggling to reach a deal on the federal budget in order to avoid a government shut-down. With so many important programs and the lives of so many people on the line, NETWORK believes that passing a faithful budget is absolutely essential. And we are not alone in that belief. This past fall, NETWORK collected nearly a thousand letters written by Catholic sisters to House Speaker Paul Ryan about the federal budget. While the sisters come from different congregations, live in different parts of the country, and work on many different issues, the underlying message of their letters was the same: our federal budget must prioritize programs that help our nation’s most vulnerable people. 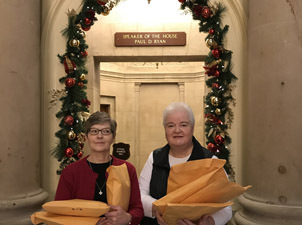 In December, Sister Erica Jordan, OP and Sister Ruth Brings, SSSF (both Speaker Ryan’s constituents) flew from Wisconsin to Washington, D.C. to meet with Speaker Ryan’s Deputy Chief of Staff and deliver the letters. Shortly after they already arrived in D.C., their meeting was abruptly canceled. They flew back to Wisconsin without being able to share their concerns or the collected letters with Speaker Ryan’s office. Fortunately, the story doesn’t end there. NETWORK is committed to working with Members of Congress and our partners to ensure that these stories are lifted up and the letters, delivered. We call on Speaker Ryan and the rest of Congress to listen to these faithful voices and pass a faithful budget. This entry was posted in Budget, Front Page, Sister Spirit on January 17, 2018 by Catherine Gillette.